Every sportsman needs at least one perfect scope mount. S&K claims: "World's Strongest Scope Mounts"
We are very proud of this scope mount as it represents the improvements of over 32 years of scope mount manufacture by our company. We guarantee this mount for your lifetime. If it fails for any reason other than deliberate destruction, we will replace it at no charge! It is handmade in our plant in the Pennsylvania hills by local craftsman who are proud of their work! There is no other all steel mount stronger or lighter! (Average weight of complete all steel mount – 2 bases and 2 rings – is 3 oz! Windage is provided in both front and rear base and our patented Smooth Kontour rings are the easiest of all rings to install. Good looking? You bet! Cheap? No – we don’t make them of castings or powdered metal, but laboriously machine them from Virgin Bar stock. But the crisp, clean lines complement the finest rifles in the world. 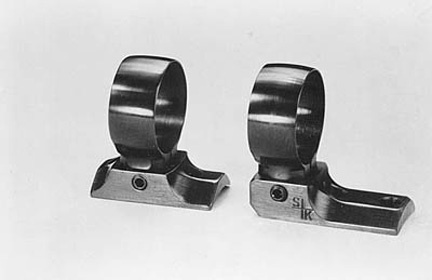 Yes, when you choose the S & K Skulptured mount with Smooth Kontour rings, you will know you have the finest available. Simply order by make, model of your favorite rifle and specify height, finish desired and any other option or accessory desired. S & K’S LOWEST 1" & 30 mm SCOPE RINGS are approximately .125 high and place the bottom of the scope approximately .385 above the highest point of your rifle’s receiver when mounted in our lowest height Skulptured bases. S & K’S HIGHEST 1" & 30 mm SCOPE RINGS will raise the scope an additional .150 above our lowest scope rings permitting scopes with up to 2-1/16 or 50 mm (Extra cost). STAINLESS RINGS & BASES – Yes, these are real stainless, not plated as some offer. Any of the above options or combinations are available in stainless – 2 times the price of our matte steel bases and rings.